DP-Accessories closed end duplex extra long (XL) spline tuner style lug nuts are among the best in the industry. Our tuner style nuts are crafted with precision machined threads to ensure a perfect fit to your vehicle's wheel studs. Manufactured with cold forged and heat treated steel for dependable strength and durability. 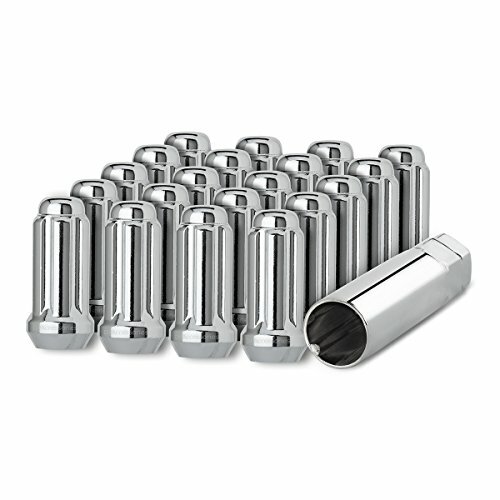 These lug nuts feature triple chrome plating with essential layers of copper, nickel, and chrome to provide exceptional strength, beauty, and corrosion resistance. Our lengthy multi-point quality control process ensures that every nut we handle is created with the same love and care as the one before it. FITS: Aftermarket wheels requiring a lug nut with a conical 60 degree seat and small diameter like spline drive or tuner style nuts. REQUIRES: 13/16" (21mm) and 22mm hex spline tool/key part # D5110K for installation and removal. One (1) tool included with this set. INCLUDES: 20 Chrome Closed End Duplex XL Spline Tuner Lug Nuts and one (1) spline tool/key for installation. Shipped in our signature premium packaging.